Skip Main Menu and go to the body text area in this page. Airborne particle counter is a measuring instrument to count the number of particles in the air with observing scattered lights of particles. Rion introduced this technologies to the market in Japan and started the business with importing the devices. To meet the various demands in the Japanese market, Rion developed the first product KC-01, which made particle counters popular in Japan. Airborne particle counters were used in the clean rooms of pharmaceutical manufacturing field as first stage, because the accurate measuring must be essential for conforming Good Manufacturing Practice (quality control standard about pharmaceuticals) in Japan. For supporting such demands for accuracy measurement, JIS standard was established for particle counters. 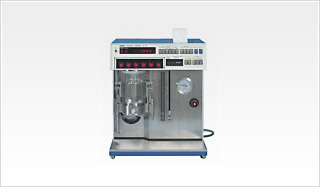 After such movements, particle counters were used in other industries. After that, semiconductor manufacturing industry became the biggest market for particle counters. In the process of manufacturing, the contamination control for cleanliness had to be essential to keep the quality and profitability for this industry field. Rion particle counters have been meeting to the demands of microminiaturization, and continuously supporting the quality control in the industry fields of household appliance and OA, like television, hard disks, liquid crystal, smart phone etc. Keeping the cleanliness of liquids. To meet the demands from pharmaceutical industry field (injections etc), Rion developed liquid-borne particle counter KL-01 as the first manufacturer in Japan. After that, liquid-borne particle counters have been used for the contamination control for cleanliness of pure water and chemicals to be used in manufacturing process of semiconductor. Further, Rion introduced several kinds of liquid-borne particle counters, including the particle counter to measure the smallest particles (30 nanometer) to meet the demands of chemicals manufacturers for semiconductor industry. The first liquid-borne particle counter manufactured in Japan "KL-01"
Rion particle counters are used in overseas market too, as they have been essential for quality control of semiconductor industry in Japan. Especially Rion particle counters could get a high evaluation from semiconductor industry market in Asian area, including famous electronic device manufactures in Korea and Taiwan. In pharmaceutical and foods manufacturing processes, it is absolutely needed to confirm that water must be clear without viable particles, but the usual methods needed the long time tests to judge and has kinds of risks for emergency measures. 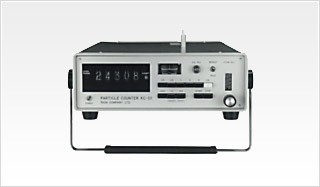 The viable particle counter developed by Rion as first in the world solved such problems. 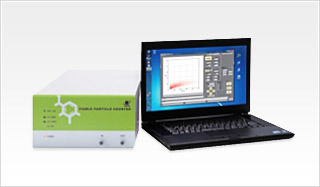 With detecting the autofluorescence of viable particles, the measuring can be done easily, accurately and in real time. The viable particle counter will be expected to be used not only by manufacturers of pharmaceutical and foods but also by various fields like water purification plants for quality control of drinking water, contamination control for cleanliness of dialysis fluid etc.